Where Did the Image of the Laughing Buddha Come From? When many Westerners think of "Buddha," usually they don't visualize the Buddha of history, meditating or teaching. This "true" Buddha is known more completely as Gautama Buddha or Shakyamuni Buddha and is almost always depicted in deep meditation or contemplation. The image is very often of a very thin individual with a serious though the sublimely peaceful expression on his face. 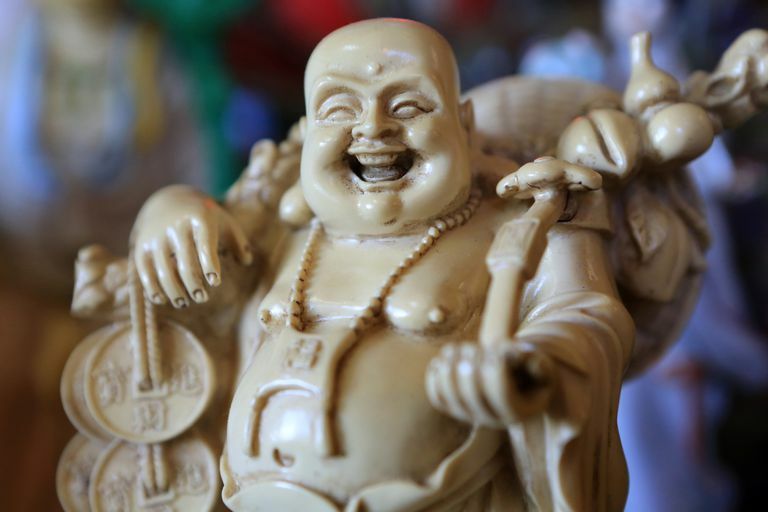 Most Westerners, though, think of a fat, bald, jolly character called "The Laughing Buddha" when they think of the Buddha. Just where did this figure come from? The Laughing Buddha emerged from Chinese folktales of the 10th century. The original stories of the Laughing Buddha centered on a Ch'an monk named Ch'i-t'zu, or Qieci, from Fenghua, in what is now the province of Zhejiang. Ch'i-t'zu was an eccentric but much-loved character who worked small wonders, such as predicting the weather. Chinese history assigned the date of 907-923 CE to Ch't'zu's life, which means he lived considerably later than the historical Shakyamuni, the true Buddha. The tales of Ch'i-t'zu spread throughout China, and he came to be called Pu-tai (Budai), which means "hempen sack." He carries a sack with him full of good things, such as sweets for children, and he is often pictured with children. Pu-tai represents happiness, generosity and wealth, and he is a protector of children as well as of the poor and the weak. Today, a statue of Pu-tai can often be found near the entrance of Chinese Buddhist temples. The tradition of rubbing Pu-tai's belly for good luck is a folk practice, however, not a genuine Buddhist teaching. It is indicative of Buddhism's broad tolerance of diversity that this laughing Buddha of folklore is accepted into the official practice. For Buddhists, any quality that represents Buddha-nature is to be encouraged, and the folklore of the kind, laughing Buddha is not regarded as any kind of sacrilege, even though people unwittingly may confuse him with Shakyamuni Buddha. Pu-tai also is associated with the last panel of the Ten Ox-herding Pictures. These are 10 images that represent stages of enlightenment in Ch'an (Zen) Buddhism. The last panel shows an enlightened master who enters towns and marketplaces to give to ordinary people the blessings of enlightenment. Pu-tai followed the spread of Buddhism into other parts of Asia. In Japan, he became one of the Seven Lucky Gods of Shinto and is called Hotei. He also was incorporated into Chinese Taoism as a deity of abundance.